I’m getting a lot of questions via email regarding the NBMEs and so this should answer all your questions. The following post is regarding the USMLE Step 1 and everything related to it. NBME stands for National Board of Medical Examiners. 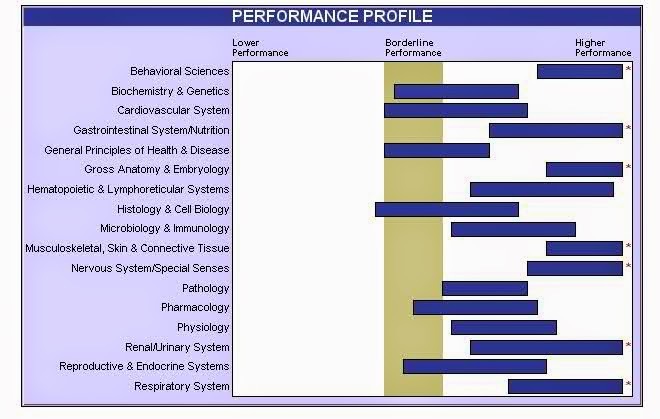 The practice tests from them which everyone should take are called the NBME Comprehensive Basic Science Self-Assessments, but we all refer them the “NBMEs”. How important are the NBME tests? If you are questioning about the importance of the NBME tests, then think about paying $800+ for the USMLE Step 1, and getting a sneak peak of how the real exam will be like. The USMLE Step 1 is written by the NBME people and the self-assessments are also written by the same people. Therefore, it makes sense to see where you are in terms of being ready for the USMLE Step 1. How much are the NBME tests? The regular assessments are $50. But the assessment with a feedback of which questions you got wrong is $60. I personally would spend an extra $10 and get the test with the feedback; it’s better to make the mistake on the practice exams and learn from it and do well on the real exam. How to use the NBME results? Take a look at the sample assessment result below, which I found on Google image search. This is what you will see after you take a self-assessment. Whoever took this exam they should focus on the subject that they are weak in. Anything that is to the left is weak and anything to the right is strong. Your goal should be to go to the right side as far as possible. If you have a star on the right side, that shows you are very strong in the subject. How to improve your NBME score? Focus on the weak subjects; as in go over the material on those subject and leave the stronger subjects alone and review them later once you master the weaker subjects. The self-assessment tests will test your core foundation so don’t assume that you have to know everything on a subject. You should never assume that you can assess how ready you are without taking any practice tests. When to take the NBME tests? My advice is to take the NBME exams after you take the USMLE World Self-Assessments. You should take at least 2-3 NBME tests before you take the Step 1. Take the NBME tests from the lower level to the upper level, such as start from From 11 and work your way up to Form 13. Try to take the practice tests 1-2 weeks apart. For example, if you take Form 11, work on your weak subjects for 1-2 weeks and take Form 12, work on the weak subjects from that and then take Form 13 the next week. Take the average of your NBME scores to get a very close approximation of what your real score could be. Never get the pirated versions of the NBME tests because there is no telling if the answers are right or wrong. Therefore, make sure you always get the real online version. Go here to get the NBME tests. I hope this helps and if you have questions or concerns then please comment below.